There mother was gone, working the forge, hunting, or healing someone most likely. The dragon taking care of them today was Rhune, and Prasi rather enjoyed the older mans company. He was fun to play with, but it was even more fun to prank him. He never got mad at her like her mother did. Prasi had managed to sneak out under Rhune's watchful eye while they were playing a game of hide and seek. She had never wanted to play that game in the first place. It was only a play so that she could escape unnoticed and wander the haven's halls. She had managed to sneak in the shadows to the tunnels that were not as crowded. Unbeknownst to her, these less crowded tunnels were getting closer and closer to the surface. Making her way to yet another tunnel that only had guards in it who seemed to be half asleep, Prasi sneaked literally right beneath their noses scooting behind the massive earthwings while hiding in their shadows cast along the walls and floors. Then she continued along a much longer tunnel that led upwards. It led to a dead end. Prasi pouted as she reached the end of the tunnel which was blocked by massive boulders and hidden with large moss and other plants. The child searched all around the dead end hoping not to get caught down here. Prasi might be able to hide if the guards came over. She could see a tiny little crack hidden in the darkness of the shadows though, and maybe just maybe she could fit into it. The child climbed up the boulder covered in moss to wedge herself into the crack in the wall. To her surprise it wasn't just a hole. The crack led further back and up through the boulders. Moss and mud blocked the light from coming through as it draped over the opening on the other side. However Prasi didn't care about getting dirty. She had found a mystery!! and now she was planning on adventuring through that moss and mud to see why there was so much light on the other side. The child slashed at and pushed her way through the moss exiting the crevice on the other side where sunlight hit her eyes blinding Prasi for a moment. Her pupils dilated getting used to the greater light, and then the child saw where she finally was. She was just inside a small cave that opened up to the vast green world of light. It was noon and the sun was high in the sky with not a cloud in sight. Warm temperatures kept the hatchling comfortable as she trotted out of the cave and looked at the trees, flowers, grass and bushes. It was so pretty out here! She could already see all of the adventures she could have. Why hadn't their mother taken them to see this place? Prasi had a look of awe on her as she walked slowly through the long grass and up to a giant willow tree. A stream babbled through the small clearing disappearing into the darker forest nearby. The IceWing rogue's light blue eyes widened as the ice dragoness slashed her metallic claws across his throat. He was lucky, though; the wound was only a scratch. "Damn you," he growled and howled in pain as Artemise's tail slammed into his side again and again. "You were the one who challenged me first!" she retorted angrily. It was her turn to cry out as the IceWing sunk his teeth into her sides. With a hiss she lashed out with her legs, kicking him aside; the rogue snarled at her once more being turning tail and fleeing. Artemis was quick to leave, not wanting to be accused of something bad. However, she didn't go far; the numbness of battle soon faded, and pain clouded her mind. The rogue had inflicted several wounds, all of them deep, and had embedded some spikes into her wounds. The worst thing was that he attacked with poison: his spikes and claws were covered in them, probably obtained from some kind of plant in this stupid, damp forest. A cry escaped her as an intense bolt of pain shot through her body, causing her to lose her footing and fall to the ground. The pain was so intense that she failed to sense an EarthWing nearby. Am I dying? she wondered distantly as her sight blurred. Maybe I am. I'm losing too much blood, and the poison... She finally gave up on trying to stay conscious, and she let the darkness envelop her. Prasi was rolling in a patch of sweet grass when she heard something. The girl paused to listen and when she heard nothing more the child then gazed at a butterfly before attempting to jump up and eat it. Artemis cracked an eye open. Where was she? This wasn't the familiar glaciers of the IceWing home. Then it all flooded back to her, and she closed her eye with a moan. Ugh. Her body hurt. She had to get treatment, which meant flying back to the IceWings; however, she was in no fit condition to do so. Maybe she should just rest for the time being. But she was curious about her surroundings, and soon she found herself wandering around in this big clearing. Then she heard a soft snap of jaws closing, and her head whipped around, eyes frantically scanning her surroundings for the source of the sound, whole body tense. She relaxed, though, when all she saw was an EarthWing hatchling. The female watched the hatchling try to catch a butterfly, the edges of her lips quirking up. This young one reminded her of her younger days. Prasi was such a pill to stalk. She never seemed to hold still for more than a few seconds before bounding off. This annoyed the scaleless hatchling very much, as he was going to glomp and nom on her horns darn it! Thankfully, his scaleless hide came into advantage as he was able to pursue the little female as she wandered through the tunnels. AuSurath was oblivious to where they were going, only having this one intent in mind to get Prasi. The only noise that came from him was his little pitter patter as his feet landed on the cool ground, running between dragons feet and dodging random rocks. It was funny, how easy it was for Rhune to lose them so quickly, but AuSurath was taking full advantage of it. Hardly realizing it until the blinding light struck his gray hide, making him stop his pursuit and shield his eyes as he smelled...fresh air and felt warmth. Blinking his eyes, he realized he was out side. Unable to contain his excitement, a little thrill came from him as he bounded out in the sun, enjoying the fresh air and sun after being kept down in the tunnels for so long. Like Prasi, he was oblivious to the IceWing near them, but he did catch site of his target, Prasi. He noticed that she was attempting to go after something, but he wouldn't let her! Charging now, he lept and attempted to tackle her, and if successful, would then start nomming her horns as his front paws would bat at her. If there's one thing Rhune learned pretty quickly with the two hatchlings, it was counting. It was still hard for him to reach the hundred, but he was learning quickly. Almost there... One hundred! Rhune opened his eyes and quickly scanned the surroundings. He wasn't really good at hide and seek, but hopefully the kids were worse than him - mostly because they got bored after a while and usually gave up their positions. The green dragon was watching over Prasi and AuSurath, the others were currently with Eysseth. Well time to find them! Prasi was in the middle of leaping upwards at the butterfly when somebody slammed into her side tossing the child back down to the plant covered earth. She huffed then cried in annoyance twisting around to growl at whoever it was until she realized that it was her brother! He must have followed her outside...AWESOME! Now they could both play together in the sun! Prasi's annoyed stance quickly turned to happiness as she battered at Au's own paws with her legs. She could do nothing about the horn nomming, and honestly she didn't mind that at all. Especially since she liked to to the same to him. However right now she couldn't reach his horns nor anything else for that matter. So the child tried to twist around Au a bit and nibble at his wing. AuSurath was sooo pleased with himself, having pounced on Prasi and able to pin her down! Letting a triumphant growl out as he had Prasi's horn in his maw, he wiggled his rear and slapped his tail back and forth, very proud of his capture. As Prasi wiggled around, he just shifted his front paws to pin her a little more, unaware of her own mouth moving towards his wing. 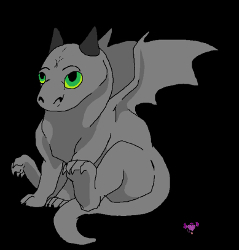 Feeling little hatchling teeth nibbling his wing, a startled and muffled yip came from AuSurath, and he lifted his head up, along with Prasi's head, and also his wing, which caused him to wobble on top of Prasi, doing a quick pitter patter of steps on either side of her as he tried to keep balance while holding onto her horn as she had his wing, and all the while trying to pin her. He was bound to fail. Rhune was definitely starting to panic even more now. The trail he was on Never seemed to be ending, but the most worrying point was that it always seemed to go up. Up toward the surface. If they fled to the surface, who knew in what kind of danger they could be in? He would never be able to forgive himself if anything happened to them. Well, Rii would probably kill him before he had the time to regret anyway. But his fears got confirmed. The trail stopped right next to a shaft, too small for Rhune to get in but definitely big enough for the two hatchlings. And some light was shining at the other side. Rhune froze, horrified. Oh no, they did it. They went to the surface. The green dragon suddenly darted away, getting toward the nearest exit to the surface. He had to get there before anything happened to the two kids! IC: Prasi warbled and whistled as Au continued to hold her down, but she was able to feel him wobble above her as she bit at his wing. His wobbling though pulled at her own head and neck as Prasi kicked and pawed back at her attacker. He held her down, but only barely as she wiggled and scratched at him. They had no idea of the close proximity they were to another strange dragon, nor the danger that they might be in.